Stroud Congregational Church is a church with a difference as it is situated on the first floor above a function room, making it less accessible than most churches in the country. 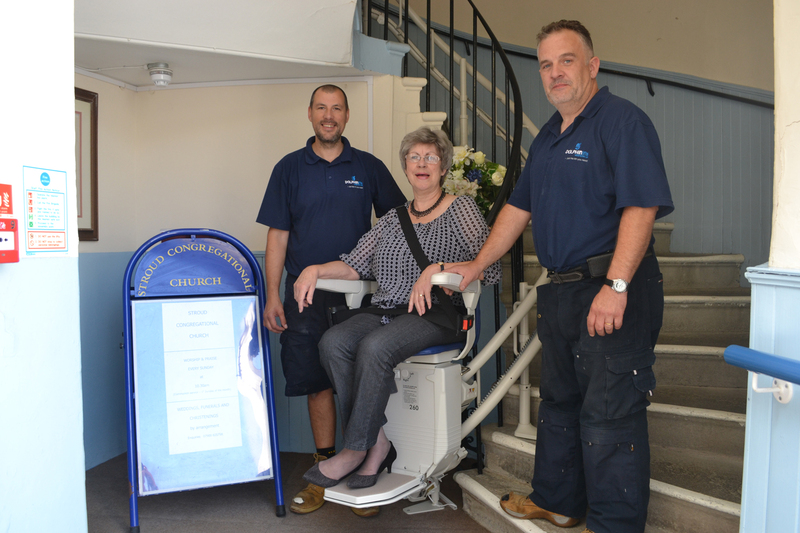 The solution came in the form of a bespoke Stannah Siena stairlift, specifically designed to wrap around the church’s stone spiral staircase. Tom explained: “This was certainly one of our more unusual installations, but working in conjunction with Stannah, we quickly put together a stairlift solution which would meet the requirements of Kay and her fellow parishioners at Stroud Congregational Church.” Dolphin Lifts’ experienced engineers Simon Andrews and Mark White were able to install the lift without any major alterations, whilst ensuring there was plenty of space for other stair users to pass by. Dolphin Lifts Western Ltd. is an independent, family-run supplier of stairlifts, hoists, homelifts, wheelchair access lifts, pool lifts and ramps, covering the South West of England. Part of the Dolphin Group – one of the UK’s largest independent suppliers of mobility access equipment – Dolphin Lifts Western Ltd. has a sound reputation among local councils, housing associations, care and repair organisations and private customers across the South West regions. It is also an approved supplier of some of the biggest brands in the industry including Stannah, Terry, Otolift, Homeadapt and Thyssen amongst others. For more information about Dolphin Lifts Western and the range of independent living solutions available please visit www.dolphinliftswestern.co.uk or call freephone 0800 1693404 to speak to an advisor.